Kalank is coming soon!Sign up to be notified when tickets go on sale near you. usheru will use your email to let you know when tickets for Kalank go on sale. 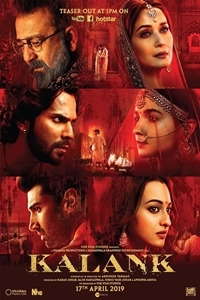 Kalank, a period film, set in pre-independent India is a story about an elite family and many of its hidden truths that begin to unfold as communal tensions rise and partition nears.Caught in this situation are Dev, Satya, Roop, and Zafar who find themselves in this battlefield of love. While the whole town is bathed in the shades of red, the question is - will these four see that red in violence or love?